When it comes to books about the world of classic television, readers can be forgiven for feeling they're walking into a minefield. Some books are little more than glorified fanzines that capably demonstrate the author's enthusiasm for his subject but can be painful to read; others are dry scholarly tombs that give readers all the facts (and I do mean all), but little of the fun behind them; there are episode guides that offer little insight into what makes a television series special; and there are those that somehow manage to completely remove an era from its cultural context. Happily, The Lucky Strike Papers is none of these. What it is is a charming, affectionate survey of a particular time in the history of both America and television, with Andrew Lee Fielding as our tour guide. It's partly a biography of the author's mother, singer Sue Bennett, who appeared on several television series during the 50s and 60s, but it's much more than that. By taking Ms. Bennett's career as his starting point, Andrew Fielding takes us through post-war America, and gives us a colorful look at the nascent television industry and some of its milestone characters and programs. In case you haven't noticed yet, I liked this book. A lot. Remember those pitfalls I mentioned at the beginning? 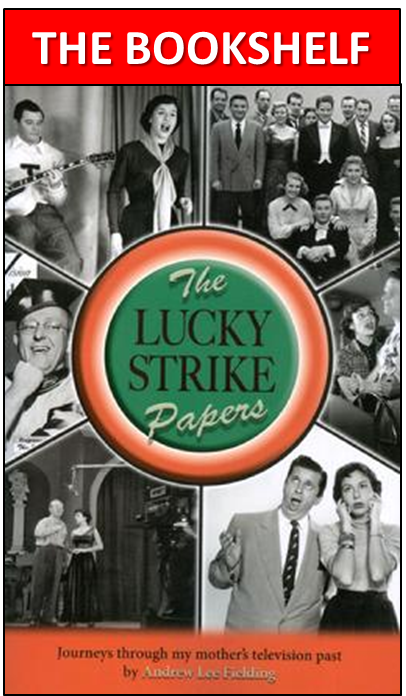 Well, the reason The Lucky Strike Papers doesn't fall into any of them is because Fielding is a writer who knows how to tell a compelling story, bringing to life people as varied as bandleader Kay Kyser, who brought his Kollege of Musical Knowledge to radio and television before becoming a Christian Science practitioner; future talk-show hosts Merv Griffin and Mike Douglas, who performed with Sue Bennett and remembered her fondly; Snooky Lanson and Russell Arms, with whom Bennett sang on Your Hit Parade, the legendary program sponsored by Lucky Strike cigarettes (hence the book's title), and many more. In doing so, Fielding avoids the mistake that so many writers make when they're too close to their subject - he's given us not a rote recitation of his mother's career in every detail, nor a loving hagiography, but an adventure through a stunningly exciting time in the history of media, with Bennett's television career as the impetus that guides us through various milestones while giving us a real look at the context in which these adventures take place. We make stops in cramped television studios, vast theaters converted for use by the new medium, the early technical wizardry of location shooting, and even the use of the famed ocean liner United States as a floating set for Hit Parade. And this tells us so much more about the world of the 50s, when popular music told stories, when transatlantic travel was the epitome of glamour, and when Americans learned about the miracle that allowed flashing images to enter their living rooms. In other words, this is right up my alley. I find it interesting that reading books about television can often be more informative than watching television itself. Programs on the history of TV sometimes devolve into a kind of home movie - and people of my age still remember the stab in the pits of our stomachs when the next-door neighbors invite us over to see the movies from their recent vacation. Books, on the other hand, can only capture still photos, snapshots of a specific moment frozen in time, and they have to rely on words to fill in the rest. And Fielding does this with a style that I found very enjoyable to read. It's not only well-written, but Fielding has a distinctive approach, using a narrative voice that's almost quasi-documentary in tone. It's very effective, giving the reader the sense of flipping through the pages of a scrapbook and reading the captions written on the backs of pictures. In doing so, he generates a warmth not only for the age, but for the people participating in it. He makes it come alive, which is one of my tests as to how good a book is. Another is whether it makes me want to learn more, to know the people whose stories it tells. And Fielding does just that. By the end, I wanted to know Sue Bennett, to be able to talk with her and ask her about those times and her particular place in television history. That's not possible now, but in Andrew Lee Fielding's book, we meet her through her son, and his love not only for his mother but for her life in television, and television itself, is the next best thing. Now, a moment of full disclosure - I link to Andrew's blog, The Lucky Strike Papers, and I've linked to several pieces he's posted. One day I got a very nice email from him, asking if I'd be interested in a copy of his book. Well, I wrote back, it just so happens that I've already got your book. Unfortunately, it's packed away in one of forty or so boxes, waiting to be transported from North Carolina to Texas. But I'm really looking forward to reading it, since I enjoy the blog. We've corresponded several times since then (Andrew is nothing if not a gentlemen, and he's been gracious in thanks when I've linked to him. In fact, I should be thanking him for providing me with such interesting things to read.) and The Lucky Strike Papers has always been the number two book on my stack of upcoming reading material. But then there was the whole JFK anniversary, and Christmas, and something always seemed to be coming up. Finally, I'd had enough. I put aside a book that I was in the middle of (I haven't finished it yet), and pulled Andrew's to the top of the list. I didn't have many doubts that I'd like it, but what if? Could I be honest and objective about a book if it wasn't any good? I think you know the answer to that. I don't go out of my way to offend, but I've never pulled any punches on this blog either. And when I say I can highly recommend The Lucky Strike Papers, you know that I've not been compromised in any way. This book is good. Buy it. Read it. Read the blog. Enjoy them - I'm pretty sure if you're reading this now, you will. Great stuff, Mitchell, as always. You have inspired me to get this book. Kudos to you both. Thanks, Steve - great to hear from you again! I don't think you'll be disappointed with the book - let me know what you think. Hope all is well!